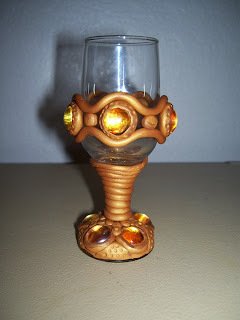 I made this mini jeweled goblet with gold polymer clay and 10 small "amber" faux stones made with flat marbles and foil. It's built up around a liqueur glass. My goal was to cover the whole thing but I got a little tired of filling in the holes and so gave up. I still like it though. It's not as if I have a lot of liqueur drinking to do but I think it would be fun to have a whole set of mixed up glasses. I'm a sucker for glasses.